Advice: Before you start, try following to get a feel for the numbers. 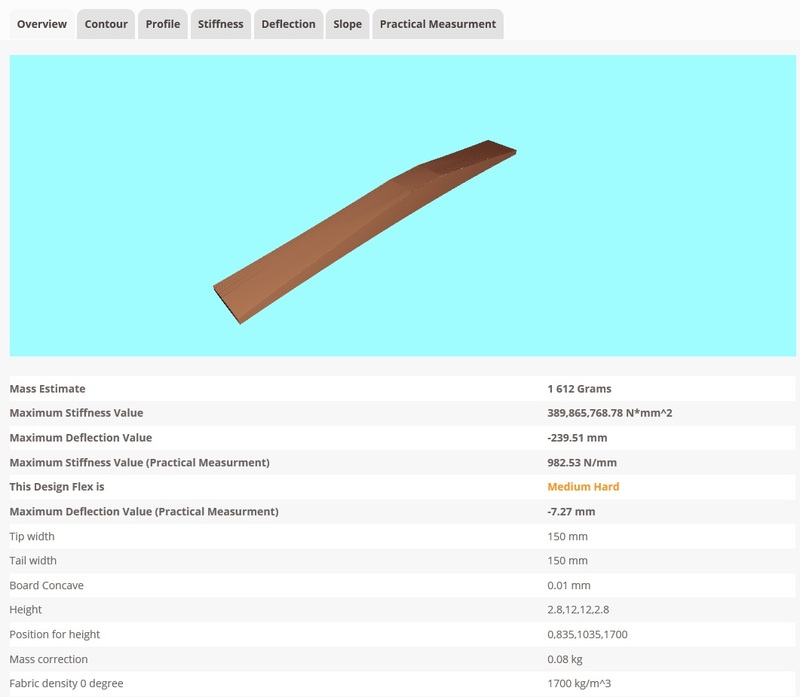 Simulate your wood core or any wood as it is, without any composites, sidewalls, epoxy or anything. See how it feels in real life and what results the simulator is giving you. Now you have an idea about what the numbers mean. 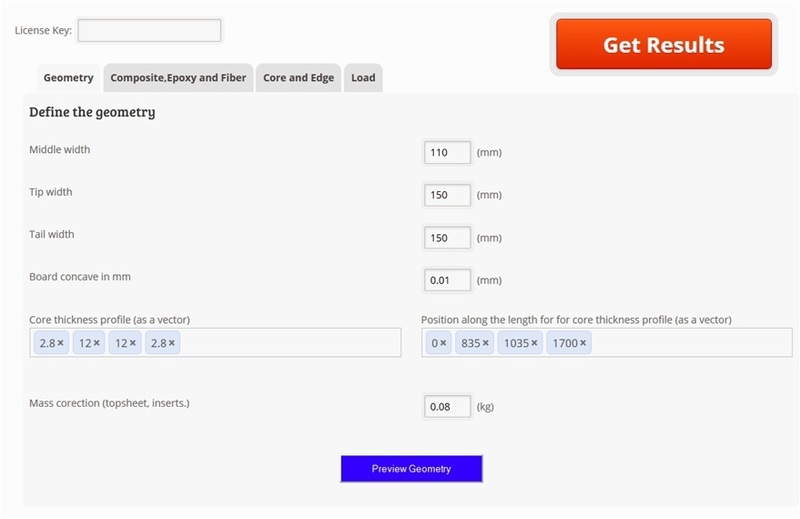 ( Set the dimensions to you wood core measures, the density and modulus to average of your wood core, sidewalls and edges to 0, and set the composite in 0 and +/-45 degree weight to 0.0001). Now try to take an existing board/ski. Measure it. Try to find some info on its core. Try to see from the sides the thickness of edges, the sidewalls and also the composites. Usually a triax composite of 650gms is about 0.6-0.8mm thick. Use this as a guideline and try to simulate and see the numbers. This will be a good start. The simulator will also give you a hint about the stiffness of your ride: Soft, ‘Soft Medium’, Medium, ‘Medium Hard’, Hard or ‘Very Hard’. Hint: Calculate your core density by weighing it, and dividing the weight by the volume. Our Simulator is a simple tool created by combining several simulators done on ski-forums and kite-forums in a way so you can get good idea how simple parameters affect your rides stifness, while also estimating other parameters such as weight. The tool might seem a bit nerdy, however, read this guideline below, give the tool a try, and dont mind contacting us if it is unclear. In general the Simulator should be used before you get your hands dirty. It is a simple tool that will help you to correctly design and test a pair of Skis, a snowboard, a kite/wakeboard or a longboard for mass (or how much it will weigh), stiffness (or how flexible it will be) and deflection. I often hear from users that the numbers in the simulator are hard to relate to. Well, the proper way to use it and get related to the numbers to what they represent in real life is to take an existing ski/snb or any board that you have, and simulate it as accurate as possible. Once you do this, you have a reference point and you can use these numbers for any future design and simulation as a reference. This is the proper way to do it. By using this tool continuously you will be able to predict physical characteristics of your ride . You will be able to set design target, such as : light weight or medium stiffness/flex . You will be able to simulate and adjust the parameters till you are happy with your design . The best way to get the understanding of the results is to start with a known design (a ride you have already and you like). Once you have simulated a known design, you will get an idea of the values that give you a certain design . Than by tweeking the design parameters such as widht, length, thickness or composite layup , you can predict how much the design will be impacted and you can design accordingly with a certain design target in mind. Why? The stiffness and mass of your ride will impact greatly the way it performs! You can also save time and money! We will also show limitations and and the work-around of the Simulator tool. Note: 3D view might have some issues some times, but the results should be valid. 1. Make sure you use the Effective length (the part actually touching the ground/water/trucks for flex simulations! The tool will include minor tip and tail compensation for the mass. 2. The tool will assume a symmetrical Layup. Same top and bottom composite fabric. This is why if you have asymmetrical layup, you can still manage, but you need to think a bit extra. If you e.g. only have one carbon stringer on top, in the tool you will get one on top and one on bottom (symmetrical). This is why you should divide the weight of your actual stringer in the tool with 2 (one on top and one on bottom with half weight). 3. The tool will automatically include a base / bottom sheet equivalent in thickness to the steel edges. If you design a kiteboards, set steel edges to 0, the base will be set to 0. Please add a corrective topsheet mass for the mass estimate. The stifness will not be greatly impacted. 4. If you have a asymmetrical layup, or need to include extra layers (stringers or so) of composite, then you need to separate your simulation in 2 or more simulations and study the impact by each one. You need to input your core contour (total width of your core incl sidewalls etc., and how it contours) and your core profile (the thickness of your wood/other core). 1) Input your design width at the middle, tip and tail. This is the core contour (width). 2) Lets input the thickness. We define it as a vector, meaning a line of numbers along the length of the core. Input the effective length and thickness of your core, as multiple values of thickness vs. length along the core. 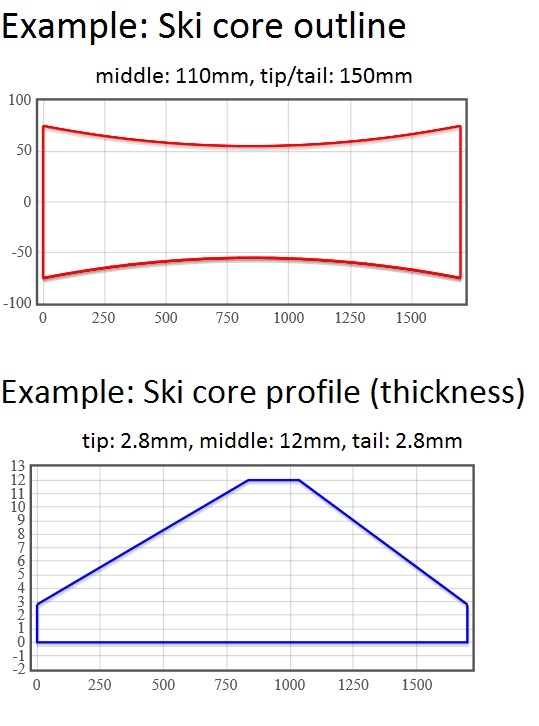 In the figure Example below, the core thickness is tapered to 2.8mm at tip (0mm length), and 12mm at 835 to 1035mm of the length of the core (this is under foot for a ski), and then again 2.8mm at the tail, lenght of 1700mm. If your design has a single concave, enter a value. Or if you have channals you can enter some value. The reason is that the channals and concave will increase the stiffness of the product, so this can be handy to get an idea. The Mass Correction value is there to adjust your mass prediction if your design has a thick topsheet, many inserts and other factors not included by the tool. Press ‘Preview Geometry’ to check your design. 2. Define the composite/the layup/epoxy and fabric. The tool assumes simple symmetric layup of composite. Top and bottom composite layers will be same. The tool assumes a triaxial layup, since this is the about the only right layup to use for best performance. In ‘Advanced Perameters’ you can play with your epoxy and the ratio of your epoxy to fiber (This parameter is only used for mass estimate and is defined as: Total Fiber / (Total Fiber + Total Epoxy). This is not a necessary step for beginners. 3. Define the Core properties and the side materials. Input your core density and modulus. The core can be any type as long as you have the correct values. If it is a mixed core, you can calculate an average density and Y modulus. If you design a Ski or a SNB, you need to include the steel edges. The thickness and width. The most typical values are preset already. Sidewall material is most usually ABS or UHMW-PE. You can input any other material as long as you have the values. 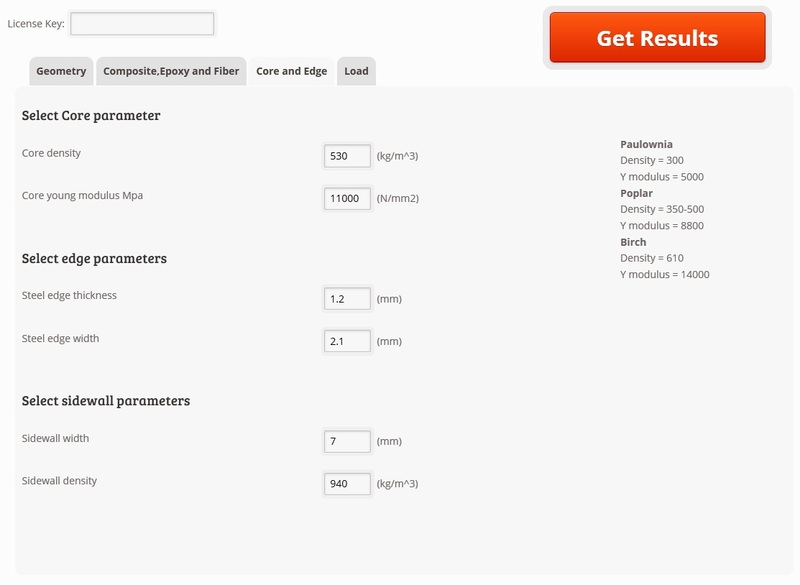 The preset values are for UHMWPE. Foot loading, where you define own own realistic loading. For this you input the load begins and load ends values. This load is applied symetrically around the center. You need to set a Load magnitude in kg. The Whole idea here is that you can do the same in practice with any other product, the same way and test how stiff it is, and use it as a guideline for all your future simulations! 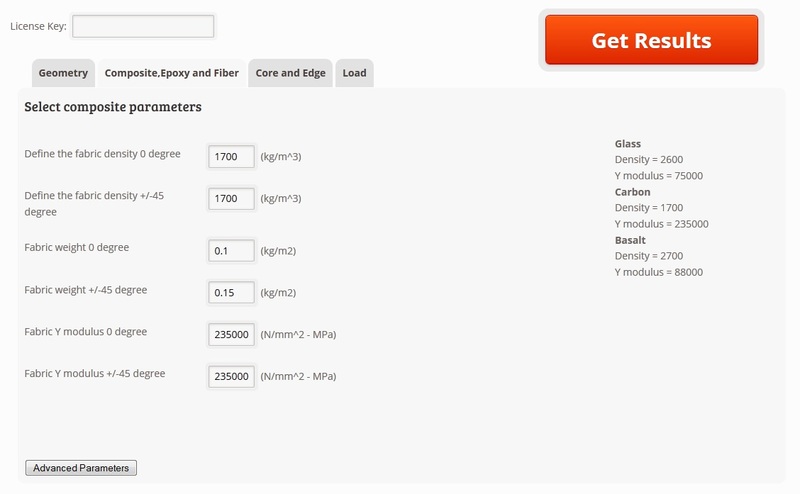 The main window will display all your set parameters so you can double check. The 3D view will show your core. Mass estimate will give you an approximate mass. The achieved Deflection for the set load. 2) the Practical stiffness. This value is very usefull as you can do same measurement in practice on any ride you have, and this way you can have a design target. How the practical Stiffness is calculated and how you can do it your self in practice? In this example a Ski is fixed to a solid object. The Ski is than loaded by a weight, 10cm away from the fixation point. The deflection is measured and the stiffness (N/mm) can be calculated as the force (gravity * weight in kg) divided by the deflection value in mm. This is the stiffness in this 1 point. Now you move the fixation point by few cm and repeat the process. Calculate the new stiffness value. Repeat this for the whole length of your ride to get stiffness in each point. The weight used here is the one specified in the Load field.